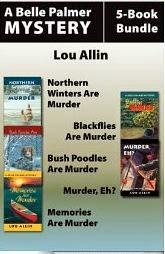 I was sorry to learn that Lou Allin, Canadian author of the Belle Palmer and the newer Holly Martin series of mysteries, died last month. Her last blog post, on May 9 of this year, humorously described her first disastrous attempt to use the medical marijuana legally available for her condition. Like her character, Belle Palmer, Allin's life and books were filled to the end with her love for dogs, good food, and the outdoors. Belle is a realtor in far Northern Ontario, whose four seasons she describes as "Nearly winter, winter, still winter, and construction." A large nickel mine in the area has recently closed down, so outdoor tourism is almost the only game left in town. Almost. In Northern Winters Are Murder, when her young friend Jim Burian, college student and part-time wilderness instructor and guide, reports hearing planes landing and taking off from the lake at night, Belle fears that illegal drug traffickers have discovered their primitive bit of Paradise. Then Jim is killed, apparently in a snowmobiling accident. No one who knew him can imagine him being stupid enough to take his machine out on a semi-frozen lake, and neither his family nor Belle are satisfied with the verdict of accidental death. Allin's books offer an excellent sense of place and climate, and the remarkable efforts required to survive them. Belle and her German Shepherd, Freya, live out of town on the lake, in a new lodge-type home. A lonely and possibly dangerous location for a woman alone, but she has good neighbors in Ed and Hélène DesRosiers. Ed is very handy; can fix most things, and Hélène's baking could rival that of Louise Penny's Olivier. Her tourtières are to die for and, while I know these luscious little pastries in the picture as pinwheels, I had never heard the French name of Pets de Soeurs. Sounds much better in French than the translation: Nuns' farts. Whatever you call them, Hélène always has a fresh batch of them* (easy recipe below) and a pot of hot coffee on hand. These newsy, gossipy stories sometimes take awhile to get to the crime, but when they do, it's horrifying, as any murder must be in a very small community whose residents must rely on each other for their survival. All five Belle Palmer mysteries are available separately, and the e-book omnibus edition is a terrific bargain. Lou Allin wrote only three mysteries in the Holly Martin series, all with interesting titles, before her untimely death. I have yet to read any of them, although the first awaits on my e-reader. In the first, And on the Surface Die, the young RCMP Corporal taking up her first post must investigate the death of a girl found rolling in the surf before an epic typhoon wipes out the evidence. These stories are set in Vancouver, where Allin spent her last few years with her partner and their beloved dogs. Like the older series, they are also available in an omnibus version. Mere weeks before her death, Allin was interviewed here for the charming Coffee with a Canine blog. Clearly, she kept her compassion, lively interest in the world, and sense of humor to the end. Godspeed, Lou, and may your many rescued pets meet you on the other side. Roll pie dough thin. Brush liberally with butter. If using cinnamon, mix it with brown sugar before crumbling over dough. Spread brown sugar and nuts evenly over dough, drizzle with syrup if using. Roll up, cut into 3/4" slices, and arrange in baking pan. (Tip, keep sides touching so they don't separate while baking.) Bake at 350 degrees for 20-25 minutes, until golden. Allow to cool for a few minutes in pan before turning out onto cooling racks. Easy and delicious. Thanks, Lou, for reminding me of these childhood treats!